DHMS 6th and 7th graders will be meeting author Catherynne Valente on Oct. 12 in select ELT classes. She is promoting her new book, The Glass Town Game, which is an "adventurous and fiercely intelligent" fantasy novel. Students who would like to pre-order an autographed copy of this book may print out the form here and bring payment to the DHMS library by Wednesday, Oct. 11. Tillie Walden will be coming to DHMS to talk about her new autobiographical graphic memoir called Spinning. She will speak to some of our 8th grade students on Sept. 22. Pre-order her books using the forms here. DHMS will be hosting a visit from Jennifer Nielsen on Sept. 1. She will be speaking to our 6th graders about her new graphic novel in the Horizons series. Use the form here to pre-order an autographed copy of her book or of the first book in the series. Your purchases help support Little Shop of Stories, a local independent bookseller, and also help assure future author visits for our students. Return your orders to your ELA teacher or the library. ​It has been a great year in the Druid Hills Middle School Library. In order to keep our students reading during the summer break we’re offering summer checkout! In order to be eligible, students must have returned all their books and paid all library fines from this school year and be returning to DHMS next school year for 7th or 8th grade. Parents will also need to sign the summer checkout agreement (print one out here or pick one up in the library). We’ll start summer checkout on Monday, May 22 and continue through the last day of school. Students can check out 5 books for the summer. Students must return the books during the first week of school in August or pay the replacement cost for the books. Books may also be returned to the DHMS main office during office hours during the summer. ​Contact Marcia Kochel with any questions. Take your picture reading during spring break and enter to win a Dairy Queen prize! We are looking for fun, creative photos that show you reading wherever you are during spring break. Photos must be real--no Photoshopping allowed, but you may add hashtags. Whether you are at home or on vacation, be creative and show us where you are reading. ​You may enter up to 3 photos per student. You are welcome to include interesting people or animals in your photos. Photos may be emailed to Ms. Kochel at marcia_kochel@dekalbschoolsga.org or printed out and turned in to the media center. It's time for the first-ever March Madless Reading Tournament at DHMS. We have a bracket of 16 of the most-read books from our library, and they will go head to head to determine which book is the most popular book of the year. The winner will be determined by all the students who vote in each round. Round one features 16 popular books going head to head. DHMS was honored to host author Marie Marquardt on Feb. 10, 2017. She spoke to our 8th graders about the human rights issues surrounding immigration and her new novel, The Radius of Us. As a result of her presentation, some 8th graders are participating in a read aloud of her book, and DHMS students are writing letters to immigrants who are detained at the Stewart Detention Center in Lumkin, Georgia. 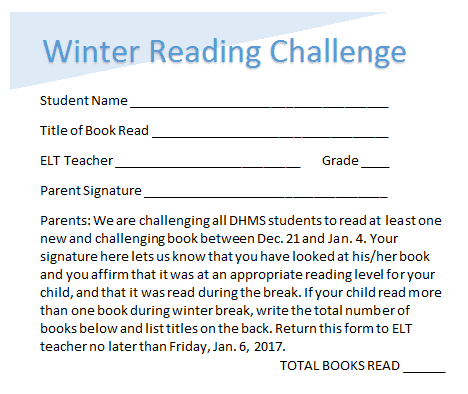 ​All DHMS students are being challenged to read at least one new book that is at their reading level during the winter break. The ELT that has the highest participation per student will win a reading breakfast in the library at the time of their choosing. There will also be a special breakfast/reading time for students who read the most books. Be sure to get a blue form from your ELT teacher before the break, read a book (or lots of books! ), and return your signed form to your ELT by Friday, Jan. 6. You can print the form to the right if you lose the one from your teacher. Find a partner and get ready to make a creative snowman. Teams will choose their supplies from what we provide and will see how creative they can be. Prizes will be awarded for Cutest Snowman, Most Unique Snowman, and more. Sign up with your partner in the library anytime before Dec. 16. There will be marshmallows involved! Get your team together and register for the Library Puzzle Challenge. Six teams of six students will be competing to see who can complete a puzzle the fastest. The competition begins at 8:20 a.m. in the library on Friday, Nov. 18. Register your teams NOW in the library and get ready for some pre-Thanksgiving fun. It was our great pleasure to host author Ridley Pearson on Sept. 27, 2016. Mr. Pearson spoke to all of our sixth graders about his new book, Lock & Key. He came to DHMS courtesy of our wonderful local book store, The Little Shop of Stories. DHMS eighth graders were privileged to hear author David Arnold speak about his new book, Kids of Appetite on Sept. 20, 2016. The author shared the story of how he became and author and how he manages writing and fatherhood.